Happy Anniversary to my very own Mr. Diamond. It’s been a great ride so far. This week as I was organizing for the move I found our box of wedding memorabilia. Hey – look at me! I have memorabilia just like a famous person. In the box I unearthed our slightly yellowed unity candle, my veil, numerous cards, flower bills and receipts from JoAnn Fabric for the material for the bridesmaids dresses. Yes, we were old school and had homemade dresses back in 1982. 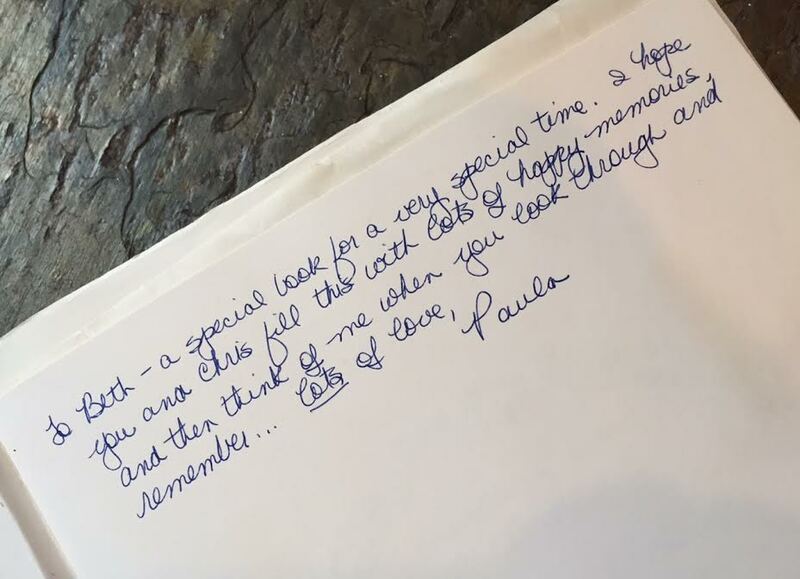 I also found our wedding album that my sister Paula had gifted me with the sweetest inscription. Since she was an old married woman with 8 years of marriage under her belt by the time I got married she knew the ropes. 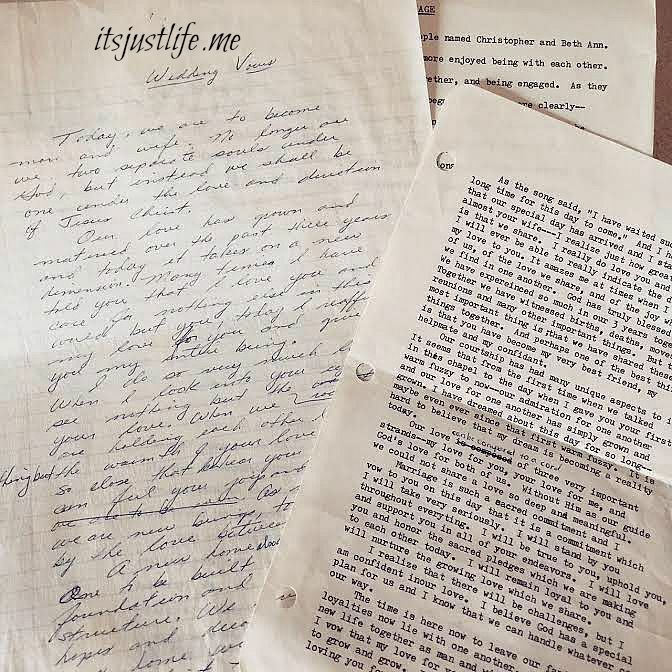 But probably the sweetest thing ever was to find both the script of the sermon that my dad preached that day as well as the vows that Chris and I wrote to each other. I had a few tears falling. Imagine that. 33 years of marriage is a milestone. Chris likes to compare it to the years Jesus was alive but I am not quite sure what that means. What it means to me is a lot of hard work, fun memories and happiness. So today here are my thoughts on how we got to this point. From the very beginning we have always been able to talk things out. Communication is the key and being able to really have good conversations about tough topics has been a cornerstone of our marriage. We have fun together. We really do. We make each other laugh and keep each other amused. We have respect for one another and that is an important thing. We realize that we are not going to be able to change the other person and while there might be things that irritate the other person we realize that in the big scheme of things those things are not really all that important. We share similar moral and religious beliefs. That makes a lot of our choices in life much easier to make because we already have the same background. We share a willingness to be adventurous to live outside of the box and try new things together. While I have drawn the line at a few things I think that being able to move around, travel and be open to what life might bring has allowed us to grow closer as a couple. We never shy away from saying “I love you”. I doubt there has been a day that has gone by when it was possible to say I love you to each other that we did not say it. There is power behind those words. We still hold hands even if mine are sweatier these days. We are able to laugh at ourselves sometimes and realize that life is too short to dwell on our imperfections. This has taken me a little longer than Chris to reach this point but I am getting there. We truly love to be together. We don’t have to be doing anything special. Sometimes it is just being in the same room. The old adage “absence makes the heart grow fonder” may just be true in our case. As we look forward to actually being together much more in the next year I realize that I have really missed the day to day stuff with him. It will be nice to be back together as a couple. So there you have it. A few of my thoughts on marriage and what has worked for us. Here’s to the next 33 years. 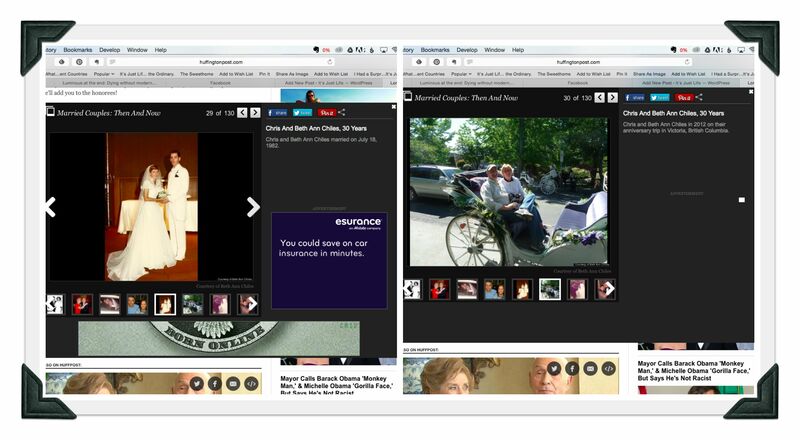 We made Huffington post 3 years ago! Sweet post. Congratulations on 33 years of marriage and may God bless you with many more years together. All of your points on marriage are spot on. Hubby and I will celebrate our 38th anniversary in October. Thank you! It is great to hear from others who have the longevity that we have as well. That is a very good thing. Happy Anniversary!! I remember back in the day when you all had been married two or three years! Look at you now. You are a beautiful couple and I rejoice in the beauty of your marriage with you! Thank you so much! We were so young but it has been a wonderful ride. Getting ready for the next chapter today as we make the final preps for the move. Thank you for your sweet words! Happy Anniversary! What a sweet post. Wishing you many more years of all Gods many blessings. Thank you so much, Becky. I think about you and keep you and Donald in my prayers every day. Love you. Thanks so much!!! Love you guys back! Happy Anniversary and what a treasure box! Thank, Sara! I have found so many fun things while packing. It has been a great tour of my life! 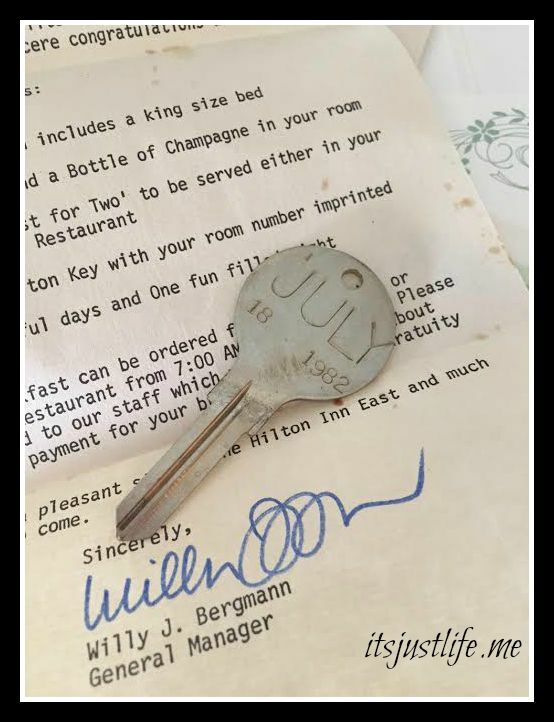 I love the memorabilia you found. I know I save too much but when you find these sort of things, it is worth it. It is so totally worth it! I have a lot of boxes of stuff for the boys and I have to really wade through those later but the problem is I get bogged down looking at everything! I don’t have time for that today! Congratulations on your anniversary, but even more … a happy marriage! Congratulations on the 33 years. Congratulations on the Huffington Post. Well thank you so very much! Happy 33rd anniversary, dear Beth Ann and Mr. Diamond! You are now officially caught up with us. I wish you many more happy years together. Yes, together as in living in the same house again.